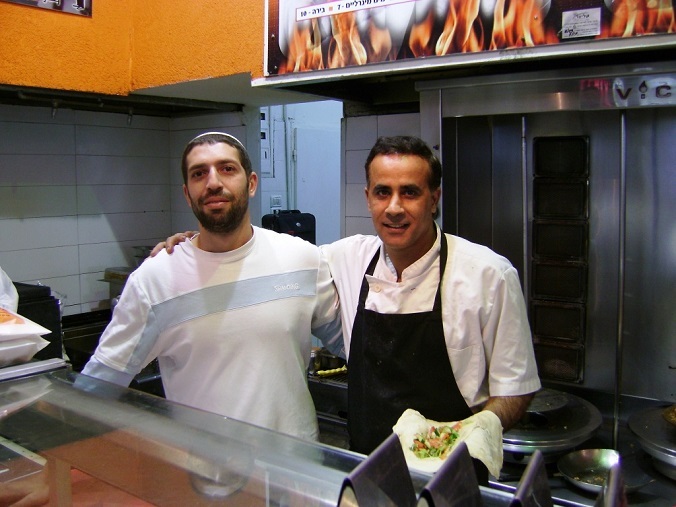 Morris on the right, and Yossi, getting ready to serve our Tour and Train group, you will love the food. I was in the Mall and went over to Morris for the best felafel in town. Morris seems to always prepare a fresh batch for me. He spoils me. As a result I cannot really tolerate felafel anywhere else in the world. I feel a tap on my shoulder, it is the owner of our local gas station. So nice to see him. We exchange a few words and I say, "The Mall changes ownership, stores come and stores go, business open and close, the place has been remodeled several times but Morris is still here! Morris is the rock, the corner stone that we can count on. And...always with a smile and a little extra something." Morris smiles at me and says..."kemo sh sarich", this is as it should be. I sat down and thought about that, as it should be, so simple but yet so profound. As it should be. His smile, his service, his throwing in a little extra salad, his warmth in welcoming us, and he is not the owner of the place, "just" an employee, and he gives service the old fashioned way, as it should be. Ah, where do you see such things these days? Morris is not a marketing expert, he is not trying to get our business, he has no motivation other than doing things as it should be. What the world would look like if everyone had this attitude. As it should be. And by the way, Morris my friend is an Arab Muslim, but that makes no difference at all, as it should be. Krav Maga as it should be. What can this mean to us? Krav Maga should be first and foremost about the people we train. It must not be first about business. It must be about you, the student; you must be at the center of all we do. Without the student there is no teacher. We exist for you. IKI exists and came into being for you. Krav Maga should always be evolving. I have had "complaints" that things change too much and some people prefer to stick to the "Old way" which they know. Change is confusing. I understand, I do not like it when I am told that I need to update my iPhone, my laptop, my computer, change my pass word. The Bank of Israel just changed the 50 Shekel bill, why! I liked the old one much better. If the BOI changed the bill there must be a good reason. In fact I found out it has new features which makes it user-friendly for the blind. That is a huge improvement. So, I must adjust. We cannot stagnate. I understand that for security reasons we are required to change our passwords from time to time. And so ...IKI Krav Maga also evolves, for your benefit, for your safety and security, we give you the best, as it should be. We offer you Krav As It Should Be. Krav Maga organizations should spell out their terms and conditions, prices and requirements very clearly. There should be no hidden costs or surprises. We should be transparent. You know what you are getting and you know what you are paying and there will never be surprises. Honesty and integrity and great training, as it should be. Nothing more, nothing less. Krav Maga should over deliver and give you more than you expect. When you place an order with us it goes out the next day. We do not wait until we have a truckload of orders. If you want a T shirt in a size we do not have, we go to the factory and make it for you, your size, your color. We over deliver, as it should be. You want your school information on the T shirt, you will have it, the cost: No extra charge, As it should be. IKI Krav Maga. We try and give you extra, more than you asked for, Why? because as Morris said, this is as it should be.